Hi guys! Ben Here. Lately I've been working a lot on gameplay code surrounding the character's movements in the world. Today I worked on getting ledge climbing working. The code to do this is based on what we did for the Cave, where we have an invisible sphere representing the volume which the character could grab if they were to extend their arms out. Imagine you're about to make that first leap out onto your school's monkey bars... kids definitely have an intuitive sense of what this sphere represents after a couple falls on the playground. So! When this sphere intersects with a ledge, blam! we know we can grab that ledge! The girl has two blue spheres attached to her: one represents the area in which she could grab a ledge above her. Another is the area in which she can automatically step over an obstruction if she runs into it (All lanky people wish they had this). 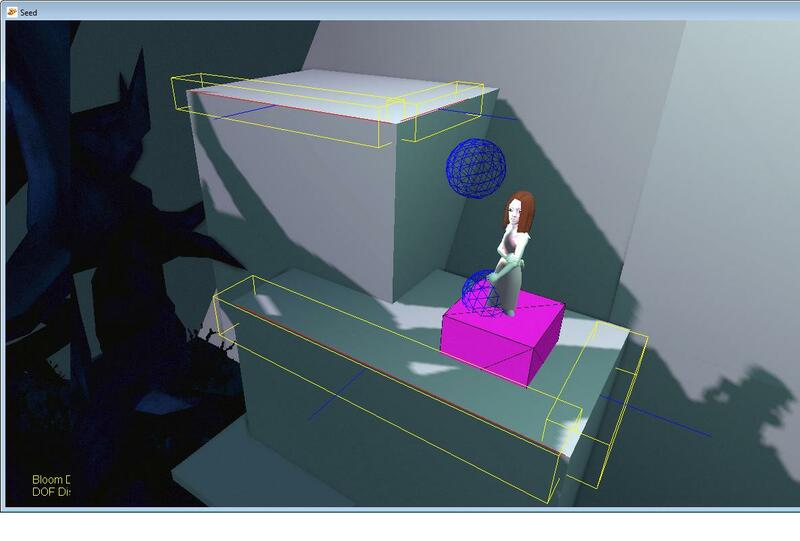 Ledges have yellow boxes placed on them using our tools in Maya, indicating that they are climbable. There's a little red line segment running down the center of each yellow box just to illustrate where the game engine is interpreting the climbable ledge to be. Also notice the blue line going out perpendicular from the ledges; these are very important so we know which way the ledge is facing! I'll try to keep this thread updated as we add more and more stuff for the girl to do! Until then, I'll try to answer any questions that pop up. Cheers! I see how you're using the invisible spheres, but I also see that her legs are encased in some kind of purple box. Is it some other kind of collision check? What does it do that the blue sphere at her legs does not? Is it for wall collisions? I bet it's to detect collision with the ground. So you know when to animate falling and stuff. Oh, duh. Yeah, that makes sense. If it WAS to detect wall collisions, my next question was going to be why there isn't a box around all of her to detect collision with things above knee level (e.q. enemies/projectiles/etc), but if it's just to hold her above the floor that makes perfect sense. I only ever make things in 2D, which is probably why the most obvious answer flew right past me. Also, don't mind the crazy wired binding bug on her face lol! Until we fix that she'll be known as Cromag girl. I smell a MMoJ character crossover! I'm starting on some rope swing traversal code. Is it a rope or a snake? The girl is not too sure at this point. Is that side to side or full 360 range of movement? We are going to constrain the swing to side to side so the controls are less confusing, but it may depend on the camera angles for this section. You can also climb up and down as you swing.